STORK apartment for 4 people near shopping mall, 45 square meters. Property 4: STORK apartment for 4 people near shopping mall, 45 square meters. BeGood apartment in Belvil in New Belgrade with a parking place . 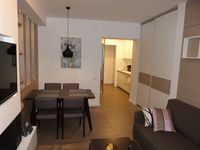 Property 7: BeGood apartment in Belvil in New Belgrade with a parking place . Property 34: Right In The Heart of Belgrade! Lovely studio in the heart of Zemun - Bohemian and Historical part of Belgrade. Property 39: Lovely studio in the heart of Zemun - Bohemian and Historical part of Belgrade. The room was very convenient and clean. The location is perfect, there are a lot of shops nearby which are open the whole day. The owner was very helpful and she picked me up from the bus station when I arrived. I would strongly recommend the room. The only disadvantage is that on Saturday night was a little bit loud outside because of the nightlife.